The concepts of SPACE, vision, MOVEMENT and LIGHT are evident in the abstract art of the twentieth century and have been used by many internationally recognised contemporary artists such as Ann Veronica Janssens, Anish Kapoor, John Armleder, Carsten Höller, Philippe Decrauzat, Jeppe Hein, Felice Varini and Xavier Veilhan. By placing the vibration and the viewer’s perception at the heart of their work, they offer multiple resonances with optical and kinetic art, a current inaugurated in the exhibition Le Movement at the Denise René Gallery in Paris in 1955, but also, more broadly, with what was then termed “perceptual art”, in the exhibition The Responsive Eye at the Museum of Modern Art in New York in 1965, in which Jeffrey Steele participated. Oil on Duck, 68.6 x 91.4 cm. JEFFREY STEELE was born in Cardiff in 1931. After studying at the College of Art of Cardiff and Newport, Jeffrey Steele dedicated himself to visual-optical research in accordance with the most rigorous principles of suprematism and neo-plasticism, and was also deeply interested in their philosophical and social theories. 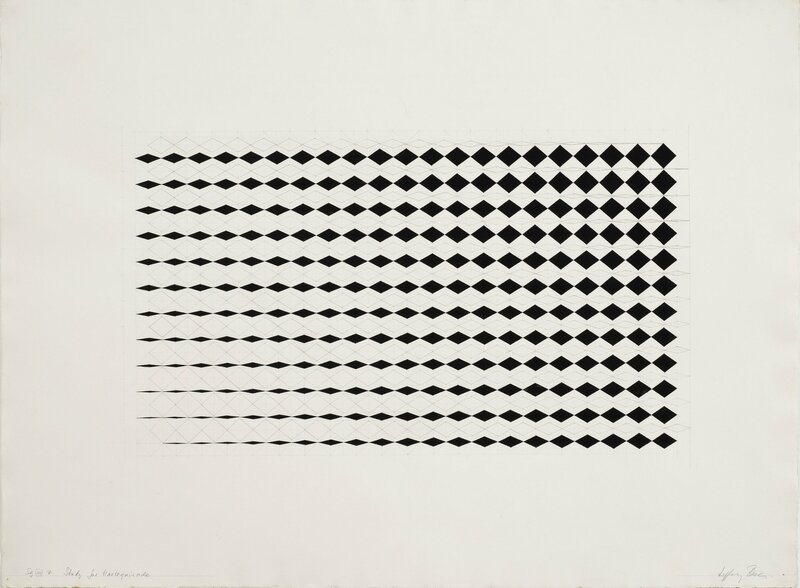 Steele’s work in the 1960s consists of two-dimensional and two-tonal spatial conceptions which – without the use of colours besides black and white – lead to the constitution of bivalent images. In a statement concerning his work Steele proposes: “…to abolish as far as possible subjective, contingent and random factors in favour of a principle of necessity; to develop a pictorial context conforming to this principle and to render this principle as intelligible as possible… and to develop a formal situation which induces the viewer to make determined movements in the real space round the objects.” These induced movements have the purpose of a great perceptive clarity. Thus the artist’s work helps the viewer to make perception, considered passive or automatic or spontaneous, an act of will and awareness. Jeffrey Steele, Syntagma Sg VIII 7, Study for Harlequinade, 1961/2012. Detail. Courtesy of Laurent Delaye Gallery. 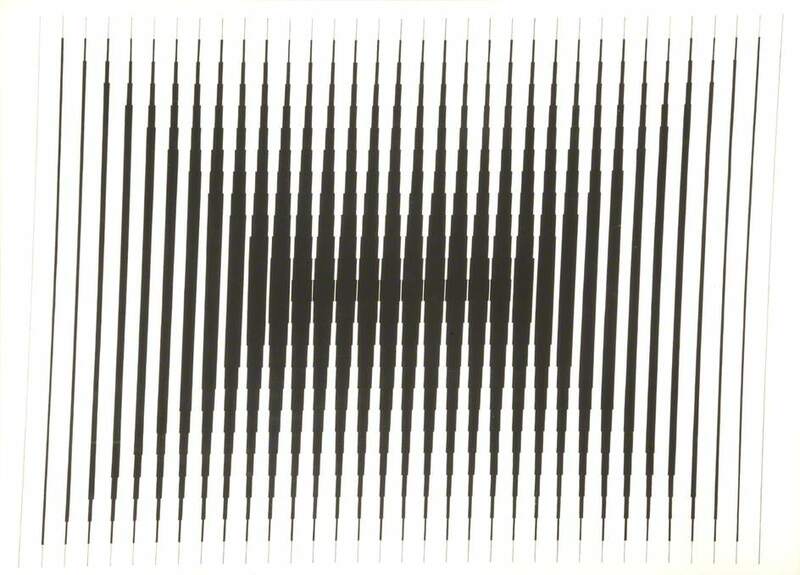 In his analysis of the kinetic qualities inherent in the act of seeing, Steele differs from other practitioners of op art who base their research exclusively on optical effects. Steele applied his work with the same rigorous coherence but without abandoning the traditional system of oil painting. In fact he considers the question of new techniques to be of no fundamental importance in visual research, and he has expressed his views on this in numerous theoretical writings. His works in the 1960s, which produce, in the words of Umbro Apollonio, “optical disturbance depending on expedients of an illusory character,” are becoming objects of growing critical interest. 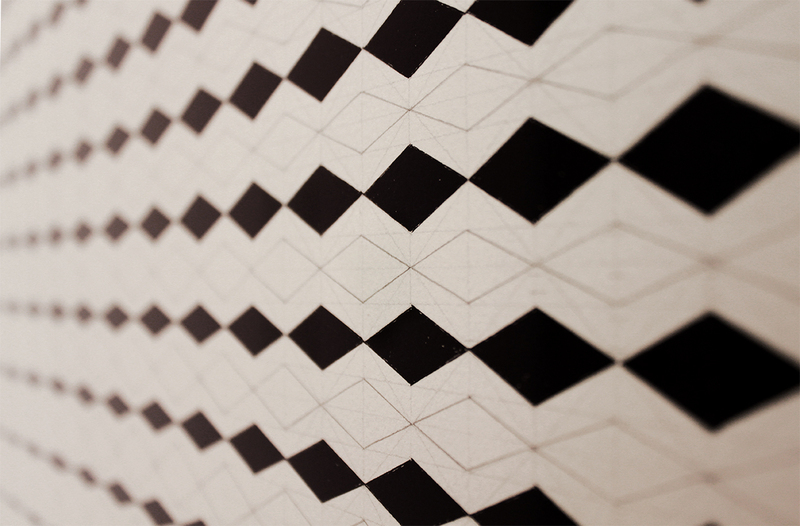 Steele has participated in major international exhibitions, such as The Responsive Eye exhibition at the New York Museum of Modern Art in 1965 curated by William Seitz, and L’ultima avanguardia exhibition at the Palazzo Reale in Milan in 1983, and Concrete Parallels/Concretos Paralelos at the Centro Brasileiro Britânico in São Paulo in 2012. His presence in the exhibition Dynamo at the Grand Palais in 2013 confirms Jeffrey Steele as a major figure in British Art. Curators: Matthiew Poirier, Domitille D’Orgeval, Marianne Le Pommeré. This entry was posted on 27 May 2013 by Laurent Delaye in Jeffrey Steele and tagged British Art, Dynamo, Grand Palais, group exhibition, Jeffrey Steele, kinetic art, Laurent Delaye Gallery, Paris.